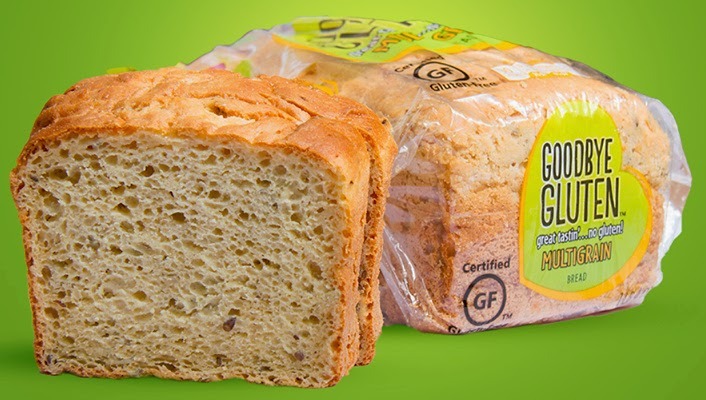 When the bakery behind Stroehmann, Entenmann's, Arnold and Thomas' products launches a gluten-free bread, you have to figure it has done its homework. Bimbo Bakeries USA, headquartered in nearby Horsham, Pennsylvania, had been testing its "Goodbye Gluten" line since mid-2012 before debuting white and multigrain breads and two kinds of sandwich wraps nationwide. Like the bakery's glutenous counterparts, the gluten-free breads and wraps are sold fresh, so they can be taken right out of the package for making sandwiches and left out for several days before being frozen. Bimbo (pronounced BEEM-bo) has obtained certification from the Gluten Intolerance Group's Gluten-Free Certification Organization for all of the Goodbye Gluten products. I recently picked up both breads in the gluten-free section of the Cherry Hill Wegmans for $5.49 each. Each loaf weighs in at 20 ounces, which yields 14 large slices. (By comparison, Udi's white and whole grain loaves are 12 ounces a piece.) Both varieties were excellent - fresh, the slices, which are 90 calories each, are soft to the touch and flavorful. The eggy white bread is made primarily with white rice flour, tapioca starch, corn starch and potato starch, while the multigrain bread adds molasses, flax seed, white corn flour, brown rice flour and sunflower seeds. Bimbo is adding wider distribution for the gluten-free products. Facebook users looking for the line can send a direct message to the company with a zip code and the company will respond. For retail store purchases, there's a link to a dollar-off coupon at the Goodbye Gluten website. The breads are also sold at Amazon.com. I have tried emailing this company multiple times but never got a response. Maybe I had the wrong contact information. I will have to try the bread too!